Many self-employed people use vehicles in the operation of their business. As most people know, the expenses connected with this use is a deductible business expense. There are some strict guidelines which one must follow to substantiate this deduction if required. Most importantly, it is an absolute must that you follow specific recordkeeping requirements. You must keep track of the total miles driven each year as well as how many of those miles were business. 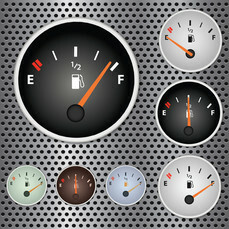 In addition, you must keep track of the date of the business mileage, the actual mileage and the purpose of the trip. We recommend that our clients record the beginning and ending odometer readings of the trip. We also suggest that clients have their oil changed at least in the beginning of the year and at the end of the year. When you have your oil changed at most places they record the odometer reading. There are two methods used to deduct your vehicle expenses. You can take the standard mileage allowance or you can use actual expenses. Obviously you would use the one with the largest deduction. With the standard mileage allowance you don’t have to worry about keeping gas, oil, insurance, maintenance & repairs, registration fees receipts or about depreciation. You will want to keep records of tolls and parking as you can take them with the standard mileage allowance. With the actual expense method you can deduct all out of pocket costs of operating your vehicle for business purposes which include gas, insurance, garage rent, depreciation, registrations, license, maintenance and repair fees and loan interest. Of course, in order to use the best method you’ll need to keep records and receipts. There are a number of recordkeeping systems available to you for this purpose. While it may seem like a difficult process, I guarantee you will be glad you did it if audited. Keep in mind this is only a brief description of deductions available for vehicles used in business. I strongly suggest you do thorough research or speak with a qualified professional.